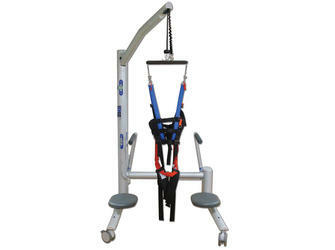 Biodex NxStep Unweighing System shown with the Standard Unweighing Harness and two Therapist Seats. Second seat sold separately. The Biodex NxStep™ Unweighing System enables partial weight-bearing therapy with open access to the patient. Offloading a percentage of body weight allows the opportunity for early rehabilitation while providing a safe environment for patient and therapist. Therapists can focus on treating their patients, manually facilitating lower extremities. The dynamic, single-point suspension of NxStep accommodates pelvic rotation and vertical displacement. This encouragement of proper mechanics allows functional gait patterns to be practiced. When used in combination with the Biodex Gait Trainer, a comprehensive gait training environment complete with audio cueing and visual biofeedback, is possible. NxStep™ Unweighing System allows full and partial weight bearing without compromising proper gait kinematics. Depending on walking speed, up to four inches of vertical displacement is permitted while the system maintains a consistent level of unweighing. The ability to allow pelvic rotation has its own advantages. Unlike two-point suspension systems that have a tendency to restrict rotation on a horizontal plane, the single-point method of NxStep permits functional pelvic rotation and versatility when walking, side-stepping, retro-walking and turning. Patients can engage in reactive postural control exercises or change direction without repositioning the entire support system. The unique, forward corner-mounted design of NxStep enables many advantages. Therapists can view patients from all angles; patients have full visibility of treadmill display and, the open design allows natural arm swing, an essential component to encourage neuroplasticity. Full Patient Access – open frame design encourages therapist facilitation and clears an unobstructed forward view for patients. One-Handed Control – press a button to raise or lower patient; another to set unweighing load. Counters Harness Slippage – Auto Unload feature compensates for potential harness movement due to slippage or posture changes. 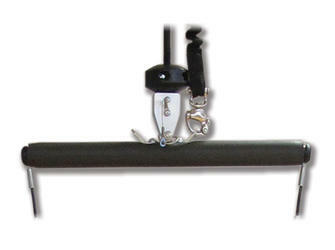 Convenient Control – newly designed hand-held remote can be magnetically attached anywhere on the frame. Safe Environment – dynamic, single-point suspension is safer for patients and negates the need for therapist support and risk of personal injury. Pelvic Stabilization – possible as single- or two-point stabilization with retention cords. Tall and Small – from pediatric to 6' 3" when standing over a treadmill with a 7" step-up, such as the Gait Trainer 3. Get Comfortable – therapist seat can easily be moved along the base of the frame or from side-to-side. A second seat is available separately. Handrails As Needed – easily removable for specific balance training exercise. Room-to-Room – collapses to 32" (81 cm) wide to fit through standard door frames. VA Hospital Study* supports the concept of the Biodex Unweighing System. The question isn’t whether to offload a patient’s weight, but how. What factors to consider should be textbook, allowing the biomechanics of gait without impeding movement. 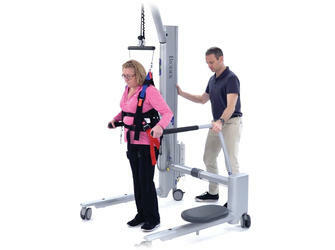 The NxStep Unweighing System allows the necessary movements to replicate natural ambulation – uniquely offered with Biodex design. The new Auto Unload feature compensates for any harness slippage, maintaining unloaded amount and position throughout the exercise. Take it a step further and partner the NxStep Unweighing System with the Biodex Gait Trainer. This combination provides the safety to treat people with movement disorders, and the biofeedback technology with objective reporting to prove need, progress and outcome. To reduce spasticity and regain functional gait through partial weight-bearing therapy. Initial unweighing support up to 40% of body weight. As the patient begins to demonstrate step symmetry, body weight support can be decreased. When used with a Treadmill or Biodex Gait Trainer, and support is decreased to 20% of body weight, treadmill belt speed can be increased to develop functional step length and step speed. physical assistance required to walk. To regain functional gait through partial weight-bearing therapy. Initial unweighing support, up to 40% of body weight. 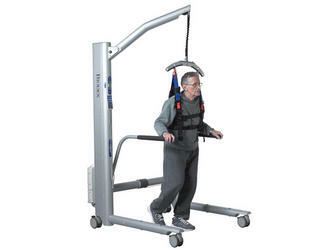 As the patient begins to demonstrate step symmetry body weight support can be decreased. When used with a Treadmill or Biodex Gait Trainer and support is decreased to20% of body weight, treadmill belt speed can be increased to develop cadence. 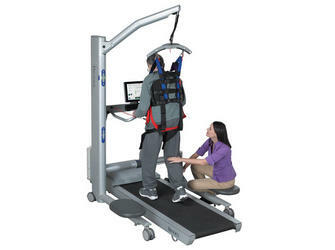 Rehabilitation can begin within the first 1-3 months following onset when there is the most plasticity of the Central Nervous System and greater potential for recovery.Improved step length symmetry and increased cadence during ambulation is achieved in an upright and fully supported position through the repetitive and rhythmic movements of the Treadmill or Biodex Gait Trainer.Effective, efficient and safe use of clinician time. Allows concentration on treatment, not physically supporting the patient. Initial unweighing support is up to 40% of body weight. Once supported, the patient can perform balance and gait training exercises, such as weight shifts. When used with the Biodex Gait Trainer, audio and visual cues are used to assist retraining of the temporal and spatial deficits associated with Parkinsonian Gait. Improvement of stride length.Maintain/Improve cardiopulmonary endurance.Effective, efficient and safe use of clinician time. Allows concentration on treatment, not physically supporting the patient. - Morris, ME, et al., Stride Length Regulation In Parkinson's Disease Normalization Strategies and Underlying Mechanisms. To regain pelvic rotation and provide vertical traction in conjunction with exercise. When used with a treadmill inclined to 3% grade, the Unweighing System will provide vertical traction. The inclined treadmill brings the pelvis into an anteriorly tilted position allowing the intervertebral foramen to open up and reduce the compression on the associated nerve(s). Once supported, the patient can perform gait and balance exercises. Reduction of compression on the peripheral nerves.Improved tolerance for exercise.Ability to exercise longer on a treadmill, providing increased core stabilization and endurance of postural muscles. Support patient in the Biodex Unweighing System. Once supported, the patient can perform gait and balance exercises. Improved confidence.Improved tolerance for exercise.Transfer of training benefits to activities of daily living.Maintain or regain independence. Initial unweighing support is up to 30% of body weight. Once supported,the patient can perform early weight shifts. As patient starts gait training, the clinician assists with foot placement. Reduction of pain.Stump toughening begins earlier and in a more gradual manner.Cardiac and metabolic demands are reduced.Effective, efficient and safe use of clinician time. Allows concentration on treatment, not physically supporting the patient. - Peterson, et al. "Physiological Responses During Unweighted Ambulation Of Three Patients With Below The Knee Amputation". To develop proprioception and weight-bearing acceptance following joint injury, surgical repairs or replacements through partial weight-bearing therapy. Initial unweighing support is up to 40% of body weight. 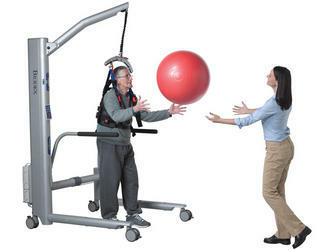 Once supported, the patient can perform balance and gait training exercises, such as weight shifts. 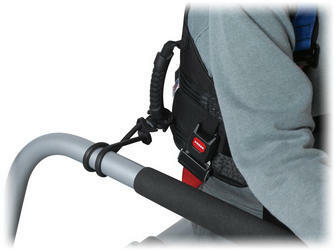 Reduce body weight support as patient regains range of motion and begin mini-squats and other weight bearing activities. Rehabilitation can begin earlier.Improve proprioception and acceptance for weight bearing activities. - Mulcare, JA, et al. Physiological responses during unweighing ambulation: A pilot study. Select the amount of weight to offload the patient. Hand-Held Controller Raise overhead bar in Load Range until indicator is in the green zone. - Suitable for use with 8' ceilings (244 cm) or higher. - O.D. : 32" w x 48" depth x 79" h (81 x 122 x 201 cm) will fit through a standard 36" x 80" door. - Battery adds 4" (10.2 cm) to depth. Accommodates patients from pediatric to 6' 3" (191 cm) when standing over a treadmill with 7" (18 cm) step-up, such as the Gait Trainer 3. Battery: Rechargeable 24V. Battery automatically charges when system is plugged in. Compliance: IEC 60601-1 and ISO 10535 for safety; EMC to 60601-1-2. Includes: Standard unweighing harness, one therapist seat, a set of retention cords and an Allen wrench.